Baby Safety Month may be coming to an end, but our commitment to infant and children safety is as strong as ever – and we need your help! 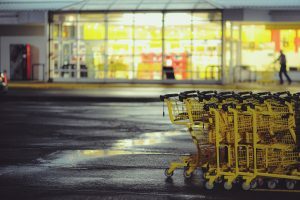 Nearly 24,000 children visit the emergency room each year nationwide due to improper use of shopping carts, but it doesn’t have to be this way. Together, we can raise awareness of shopping cart safety and help keep children safe at the store. Here are three ways you can join our campaign to promote child safety in the shopping cart. Social media: Did you know, in addition to our blog, we have Facebook and Twitter pages where we share child safety content on a regular basis? We encourage you to follow us, and like and share our posts so we can reach a wider audience with the important message of shopping cart safety. Submit a request to your store: Use our store locater to determine if your favorite retailers offer Safe-Dock to make the shopping experience simpler and more convenient for parents and caretakers. If your store doesn’t currently have Safe-Dock, send us an email through the locater explaining why you think it should install the docking stations and we’ll make sure your store sees it. In our experience, stores that receive enough requests will invest in equipping their carts with Safe-Dock, so encourage your family and friends to submit requests too! Contact us to learn more: We’re always seeking passionate parents to help us spread the news about shopping cart safety. If you’re interested in becoming involved beyond sharing posts on social media and submitting store requests, we would love to hear from you. Contact us today at the following link: http://www.shoppingcartsafety.com/contact-us/. With your help, we can make the retail environment safer for children. Won’t you join us?